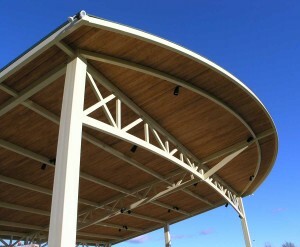 A shade shelter for the park, with an interesting custom curved crescent shape is shown here. 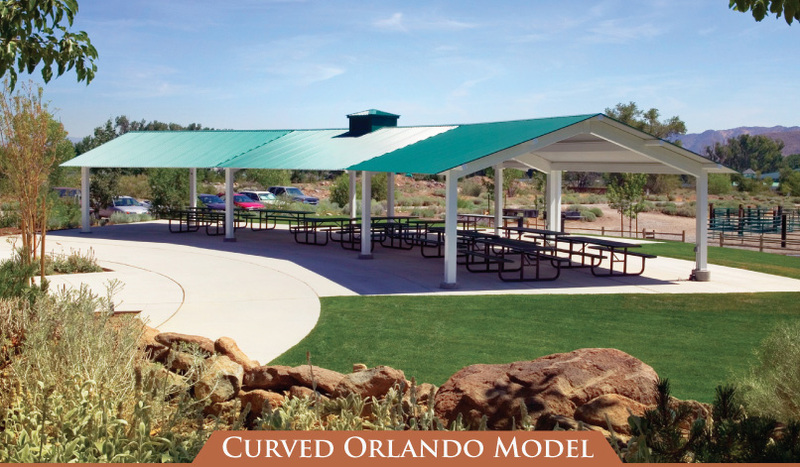 This curved Orlando model is located at the Bartley Ranch Park in Reno, Nevada. This structure is quite eye-catching in a park environment. It has a custom cupola, 24-gauge HR-36 steel roof and a powder coated finish. At this park it was surface mount and installed with custom footings to accommodate the slope. The park has a small matching shed for storage nearby. The celebration officially launched the new covered stage built and installed by Classic Recreation Systems. The covered metal stage structure is at the Civic Center Amphitheater and this grand opening was the first of many events to be held. The Grand Opening was attended by local dignitaries and esteemed guests from the Quad-City area. Live music and entertainment was provided by the Bradshaw Mountain High School Jazz Band, Mile High Comedy Theater and Yavapai College Jazz Band. This free public event on the rolling lawns of the Civic Center Campus provided plenty of free parking and space to set lawn chairs and blankets for an open air evening of festivities. Dinner and free entertainment were enjoyed with an unobstructed view of the mountains and sunsets from the Civic Center amphitheater. Box Dinners (chicken, beef or vegetarian wraps, pasta salad and lemon bars) were available for pre-purchase. Snacks and refreshments were available onsite from the Bradshaw Mountain Band Boosters. Visit the Quad Cities’ newest outdoor venue with an atmosphere of class, comfort, taste and distinction. Enjoy the covered theater proudly manufactured by Classic Recreation. ”We look forward to the many events, celebrations and memories to come” said Brian Witty, Director of Parks and Recreation. Please contact the Town of Prescott Valley for additional information. Many Colleges, Universities and other organizations are revising their smoking and tobacco use policies. This includes Yavapai College which has a new official policy that goes into effect in Aug. 2016. The Yavapai College policy allows people to smoke on campuses within a limited number of designated outdoor areas, according to a news release. Many of these areas are already constructed, marked with signage and furnished with tobacco product waste receptacles. 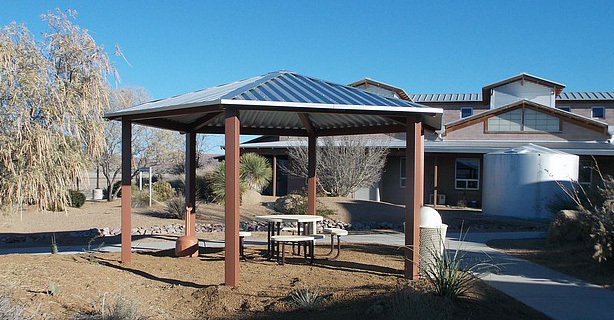 Classic Recreation supplied the smoking shelter to Yavapai College. It is a durable powder-coated quality metal structure that will withstand the outdoor environment and provide protection and comfort for the smokers. At Yavapai College, smoking includes, but is not limited to: carrying a lighted or smoldering cigarette, cigar, pipe and inhaling e-cigarettes or vaporizers. Smokeless tobacco products such as snuff and chew are also prohibited within college vehicles, buildings and residence halls, and within 25 feet of building entries, doors, windows and air vents. No such restrictions have yet been placed on what someone may do inside their personal vehicle. After initial opposition, since the announcement was made that Yavapai College would compromise by only restricting smoking or tobacco use to certain areas, there hasn’t been much push back. 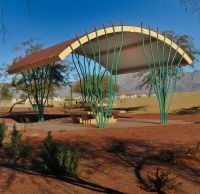 The quality shade structures from Classic also added to a more acceptable environment for a solution allowing people to smoke. 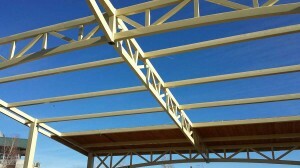 The shelter installation at Yavapai College can be seen in the photo below. To read the article published in the Daily Courier, click here. The Town asked Classic Recreation Systems to design a structure that would meet their budget and provide the desired amenities to fulfill their needs. Classic Recreation utilized our standard powder coated tubular steel frame and designed and fabricated custom tubular steel trusses. The roof included a 2”x 6” tongue and groove ceiling and standing seam roof to match the existing buildings. 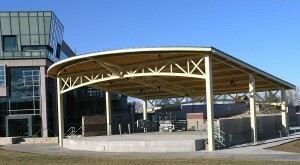 Classic Recreation designed this structure to fit the stage which was extended approximately 15’ in front. Work was wrapped up and the town holds concerts under the structure. This shade for amphitheater structure was part of an overall project with construction crews upgrading the outdoor Civic Center amphitheater and integrating the custom covering over the stage. The roof construction project was completed in January, 2015 to ensure that upcoming holiday events would not be disrupted. “They are working hard to keep the site secure and they pulled the wood forms off the front of the stage this morning,” the town’s Capital Projects Coordinator Kim Moon said at the end of the project. She added that, based on recommendations from the town’s Parks and Recreation staff, the custom Sierra Model pre-fabricated roof matches the architecture of the Civic Center complex that includes the police and library buildings. Click here to read the article from the Prescott Valley Tribune. 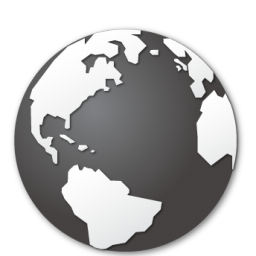 Please call us at (800) 697-2195 or email for pricing and additional information. You are at a beautiful park, enjoying the wonders of nature, when nature decides to “call.” You look for the nearest restroom that doesn’t consist of a tree and it’s not so soft leaves, when behold, all you can find is the dreaded port-a-potty! This port-a-potty looks like it has been used as Rocky’s punching bag, the heat has transformed the aroma from the inside contents into a scent no candle maker is clamoring to add to their collection, and that lovely heat has also made the temperature in the inside of this little cubicle so hot that even your sweat beads are sweating. So how do you do your business? You either bare the horrible elements, or you leave the park to find a more suitable “potty” area. 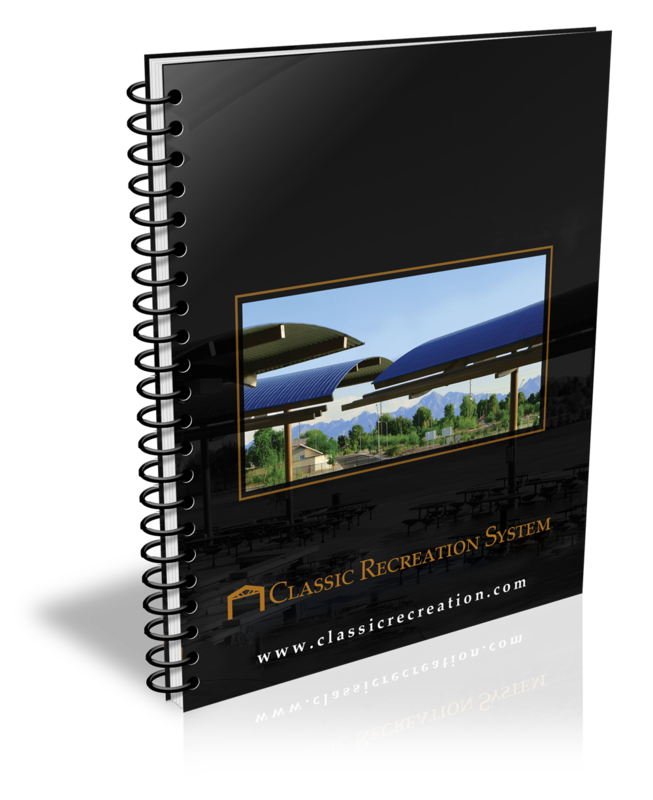 Classic Recreation has created a line of eco-friendly and solar shade structure products so that you don’t have to leave an area to find a more suitable refuge to do your business. 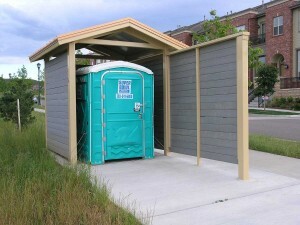 These structures, which can enclose the port-a-potty, were created not only to add a comforting look and feel to the traditional port-a-potty with sleek lines that maintain the architectural theme of the park or site, but these structures provide shade so that the internal temperature of the port-a-potty stays much cooler, providing more comfort for the user and minimalizing the port-a-potty aroma which can be heightened because of the heat. 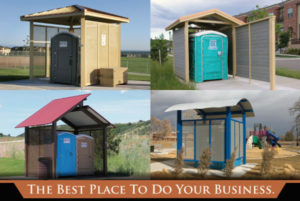 These structures, which are ideal for parks, recreational areas, and community sites, improve the look of the facility, helps deter vandalism and overturning, and protects the port-a-potty from the elements, extending the life of the port-a-potty. These are just four of the many models that Classic Recreation offers to help add beauty and function to your port-a-potty. 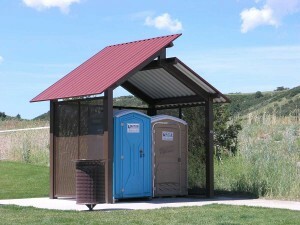 The Mesa model is one of the more popular models that can feature a standing seam and hip roof design to efficiently protect your port-a-potty from the elements. It is available in different shapes and sizes. The right picture is the Orlando model with a privacy screen. This model is a sleak and more cost-effective design. 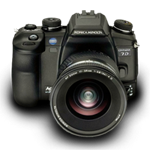 The Orlando model is also easily customizable and available in different sizes. The picture on the left is the Northwest model. This eye-catching and striking design offers excellent ventilation due to its clerestory roof design, while still providing protection against the elements. This model is available in many sizes and roof pitches. The picture to the right is a Colorado model. This model provides a distinctive curved roof that offers an uncluttered appearance. The Colorado is available in different sizes and is also available with ornamentation. Most of these structures can be augmented with a gate, screen, or screen in an “L” shape to improve privacy, security and vandal resistance. For years the residents of downtown Glendale had been looking for something to do when the stifling heat of the California sun was beating down. Until just recently the answers seemed to be simply this; stay inside. The reason was that Glendale had a severe lack of open spaces and no place to go when the temperatures started to rise, leaving residents with little choice but to seek shelter indoors, out of the sweltering sun. That all changed when the Pacific Park Pool Project was born. 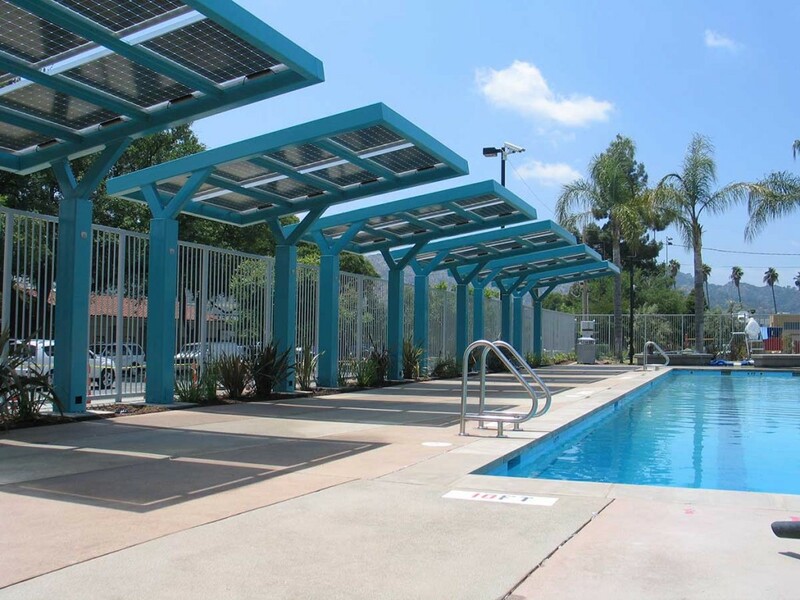 Today the lucky residents of this urban California community have a 4900 square foot, 6-lane swimming pool facility surrounded by comfortable shade structures. Visitors can use the pool to cool off and enjoy themselves, even when the temperature skyrockets. 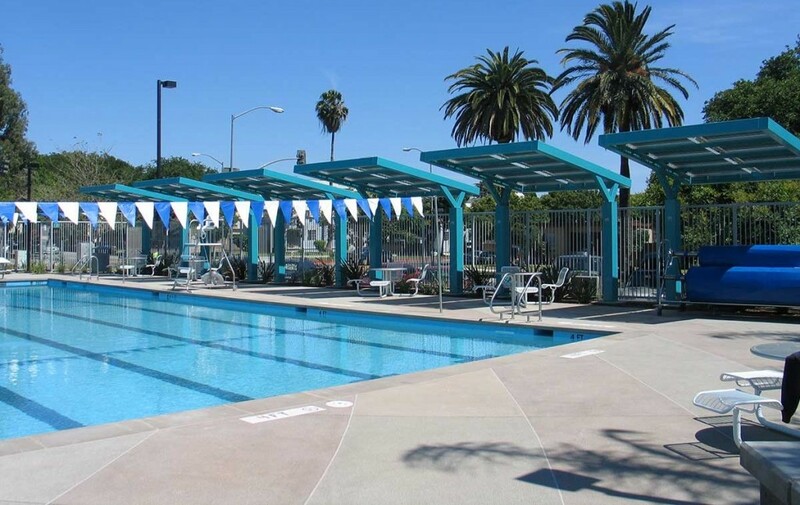 Not only is the pool fantastically beautiful and eye-catching, it’s also accessible by foot, bicycle or with Glendale’s public transportation system. It’s also one of the most high-tech swim & recreation centers in the state and possibly the country. 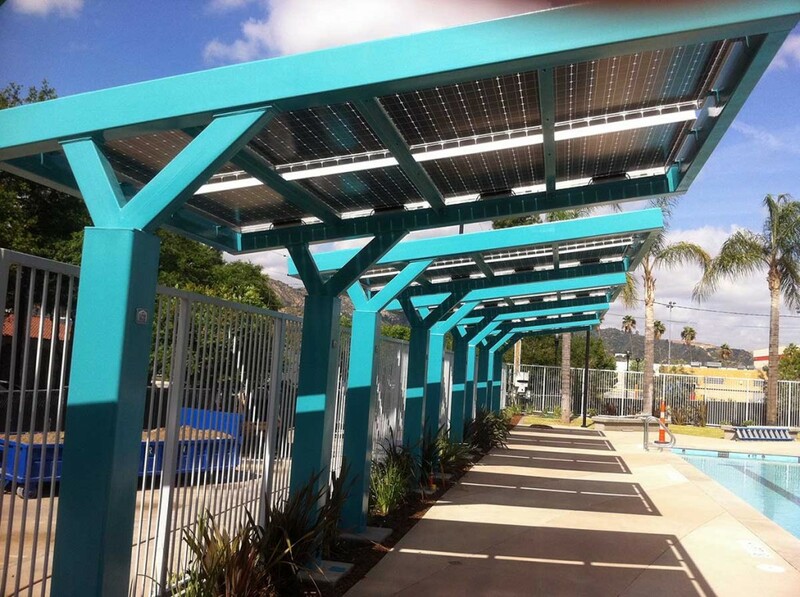 As one of the major partners in the project, Classic Recreation provided state of the art, high-tech shade structures with incorporated solar panels that provide nearly 40% of the facilities energy as well as looking fantastic and adding much-needed shade to the pool’s deck area. Centrally located at Pacific Park the new high-tech swim pool has given residents of this overcrowded inner-city area a new reason to celebrate and a lovely new facility that incorporates some of the world’s leading green technologies. Classic Recreation is extremely proud to have been involved in the design process and the results of their combined work have to be seen to be believed. Today, thanks to Classic Recreation and the myriad designers of the Pacific Park Pool, when someone in Glendale asks the question “what should we do today?” the emphatic answer is “let’s go to the pool!”. The facility has two arrays of photovoltaic panels, one on top of the shade structures and one on the building roof, which generate approximately 22,000 kWh of energy per year, roughly 40% of the building’s energy demand. 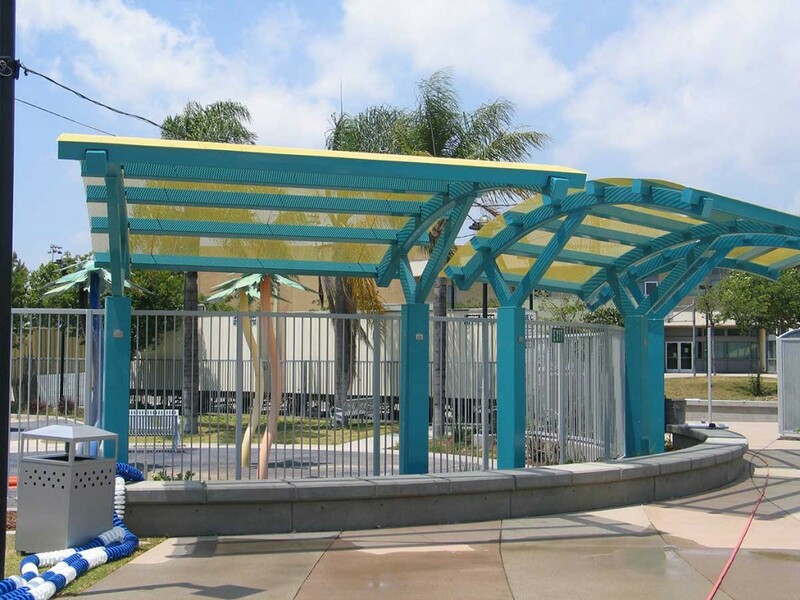 Shade structures give a place for people to rest and relax out of the sun. The City’s mandate for a Green Building, the project received a LEED Certification with a Platinum Rating. 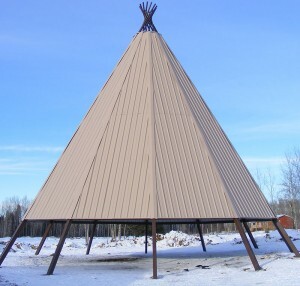 An all-steel 60’ diameter and 60 foot tall 12-sided tepee is now located in Chard, Alberta Canada. Chard is in the far northern reaches of Alberta. 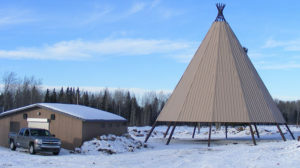 The large tepee serves as a focal and destination point for the Chipewyan Prairie Dene First Nation tribe. Pat Zelenak with Playworks, Inc. located in Edmonton, AB Canada came up with the idea of creating the structure. The 60 foot tall tepee serves as a picnic shelter, entertainment pavilion and pow wow area. It has a large fire pit located near the front. Native scenes are painted on the steel walls/roof of the tepee. This tepee is thought to be the largest fully covered tepee in North America, if not the world. The Dene First Nation is an Athabascan speaking people which call themselves “Dene”, meaning “The People”. The Dene has been in the Athabasca region for thousands of years and were hunters and gatherers migrating with the Baron Caribou.It is believed that some of the Dene people migrated south to the United States and became what is now known as the Apache and Navajo nations which are now largely located in Arizona. It seems only fitting that this one of a kind tepee has been created and fabricated from a company in Arizona and is being installed in the north for the Dene People. Classic Recreation Systems, Inc. is proud to be a part of this ancient history and hope the Chipewyan Pairie “Dene” First Nation people will enjoy this unique structure for years to come. 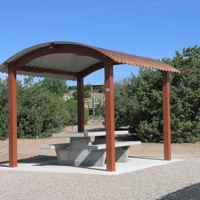 As part of the Cochiti Campground Phase II development plan, a series of attractive, copper-colored curved panel shelters were constructed to provide shade for picnicking and play. Located in New Mexico in Sandoval County, the project included the construction of about 30 such shelters. 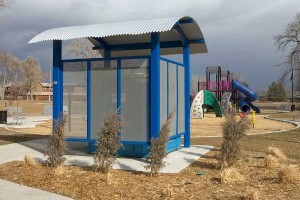 They were fabricated by Classic Recreation Systems, Inc. Classic specializes in pre-fabricated steel shelters that can be quickly assembled at the job site using hidden bolt connections. 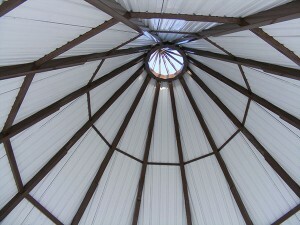 The Cochiti project utilizes Classic’s 12’ x 12’ Colorado curved roof model. 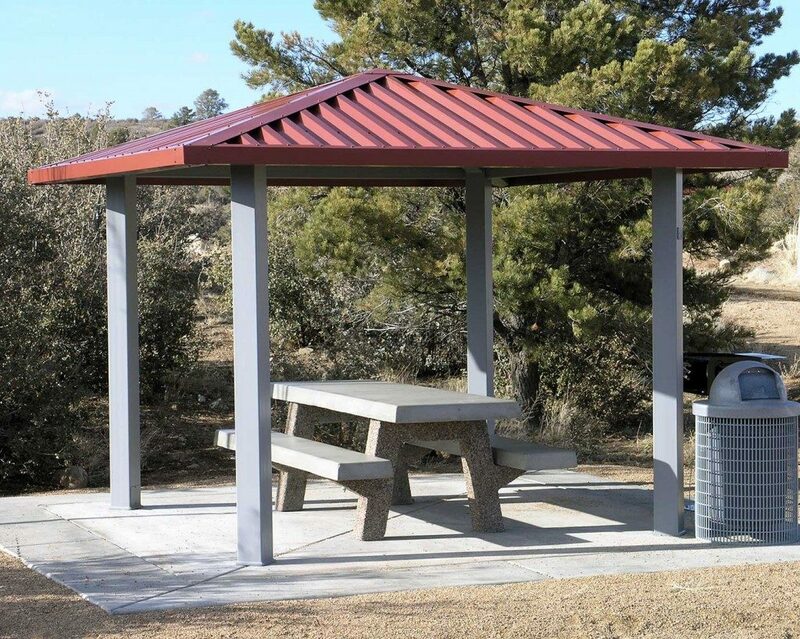 Classic Recreation’s Colorado curved-roof shelters come in a wide variety of sizes ranging from 8’ to 50’ in width. There’s no limit to the length they can be produced in. The recreation site/campground is located within the boundaries of the Pueblo de Cochiti Indian Reservation. Cochiti Lake is on the Rio Grande, about halfway between Santa Fe and Albuquerque. In Nevada, the Las Vegas Wash Trail system is being developed on a phased basis to connect a network of paths stretching across the valley from northwest Las Vegas to the Clark County Wetlands Park. Most of the trails run along the washes, hidden gems providing a habitat for nature and a respite for city-weary visitors. The trails provide routes for pedestrian and non-motorized vehicles and are dotted with a series of curved-roof structures, fabricated by Dewey, AZ’s Classic Recreation. The prefabricated steel structures offer a cost-effective alternative to site-built shelters without compromising aesthetics. For the Las Vegas Wash Trail system, Classic Recreation has provided 16 Ocotillo model shelters and one Colorado model to date, ranging in size from 10’ x 10’ up to 20’ x 20’. The Las Vegas Wash is an important ecological resource for southern Nevada as well as a recreational experience for trail users. It provides habitat to more than 300 fish and wildlife species and nearly 300 species of plants. The trail system has been so popular that it is being expanded. 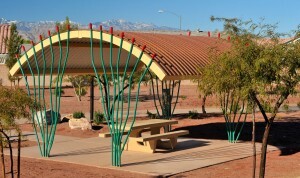 Several additional Ocotillo structures have been added since 2009. For more information about the recreation area, click to read more.